“a golden tone in all registers with the utmost sensitivity to where every phrase is moving” – The Strad. She performs in prestigious venues around the world and is frequently broadcast on the BBC, Classic FM, and Deutschland Radio Berlin. 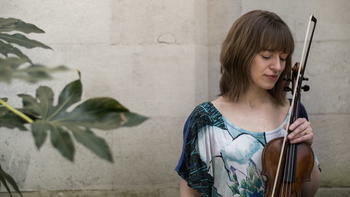 In her acclaimed Bach 2 the Future project she commissioned and recorded six companion pieces to Bach’s Partitas, featuring splendid new compositions by Sally Beamish, Peter Maxwell Davies and Adrian Sutton alongside works by Bach, Ysaÿe, Stravinsky and Sibelius.